Why does my engine rattle and how do I fix it? An engine is made up of many moving parts that have close tolerances. These parts are lubricated by pressurized motor oil provided by the oil pump which is located inside the lower part of the engine inside the oil pan. It is normal for an engine to make a slight rumble or roar while running but if you hear a distinct rattling noise there is a problem. Many spring steel and metal bearing components make up the inner workings and several external accessories of an engine. These metals are subject to many cycles of being hot and cold which can fatigue the material causing them to crack or break. Surrounding an engine is also a variety of metal plates that support accessories which must be driven by the engine such as the alternator to supply electrical power to devices such as the fuel pump and lighting systems. If a mounting bolt to one of these supporting brackets is missing or left loose at the factory or during a repair it can cause additional strain on the metal creating a break which will make a rattling sound. The cost of fixing a rattling sounds will vary greatly for example; a loose or missing bolt on an exhaust system heat shield would cost about $20.00 to $25.00 (US) if you took the car into a shop. If an internal engine part has failed the bill could be a bit larger if a timing belt or chain tensioner or guide needed to be replaced which can cost between $400.00 and $800.00 (US). Your best defense again unexpected surprises is to do a little investigation and see if it is something you can fix yourself or have done at a shop. The full video of this repair is at the end of this guide. Motor oil is used to lubricate the inner working of the engine. This oil needs to be checked from time to time because it slowly gets burned by the engine. When the oil level becomes low it will allow the oil pump to scavenge air and mix it with the oil causing friction between moving parts which can produce a rattling noise. Shut the engine off and then locate the oil level dip stick which is usually designated by a yellow handle. Remove the dip stick and wipe it off with a paper towel and reinsert it. Then pull the stick out to observe the oil level it should be between the two marks or dots on the stick. If no or low oil levels are observed then add oil until the level is correct. The space between the marks represents 1 quart. 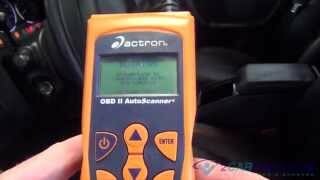 Here is a video of a complete oil change where our mechanic checks and adds oil. A belt tensioner is designed to hold pressure on the belt so it does not slip on the drive or accessory pulleys. 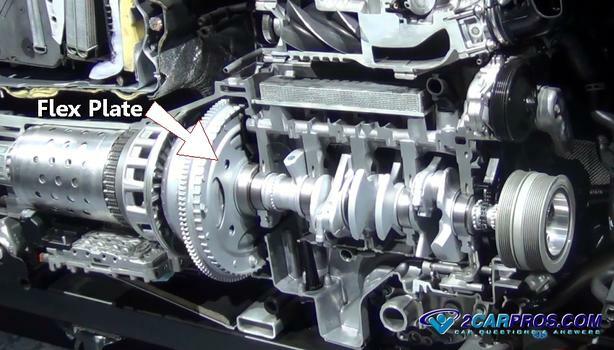 This part is spring loaded and when its internal spring breaks or when the tensioner pivot wears out it can cause a loss of pressure which will cause the belt to slip and then quickly grab causing a rattling sound. While the engine is off reach in and test the tension of the belt. If the belt is loose or has little pressure holding the belt then the tensioner has failed and needed replacement. You can also start the engine and observe the tensioner in action. 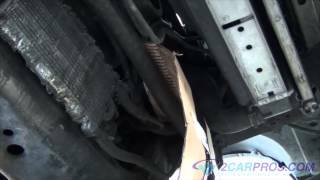 If there is excessive vibration suspect the serpentine belt has gone bad and is in need of replacement. 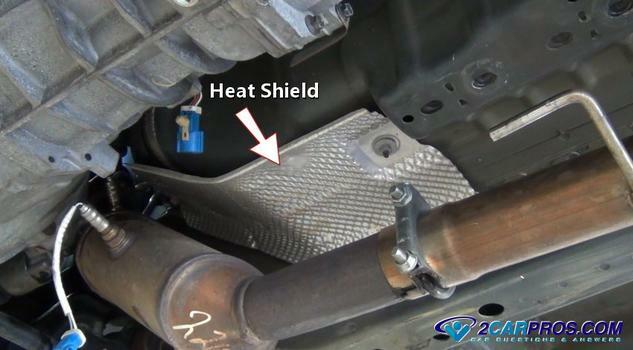 The exhaust system in the car uses heat shields over the manifolds, catalytic converters and exhaust tubing to keep heat from penetrating the floor of the car and causing damage. These shields are made of thin metal and when they come loose or break they can make a rattling sound while the engine is running. Some of these shields are accessible from the engine compartment while other times you will need to jack up the car and get under it to check out the shields. 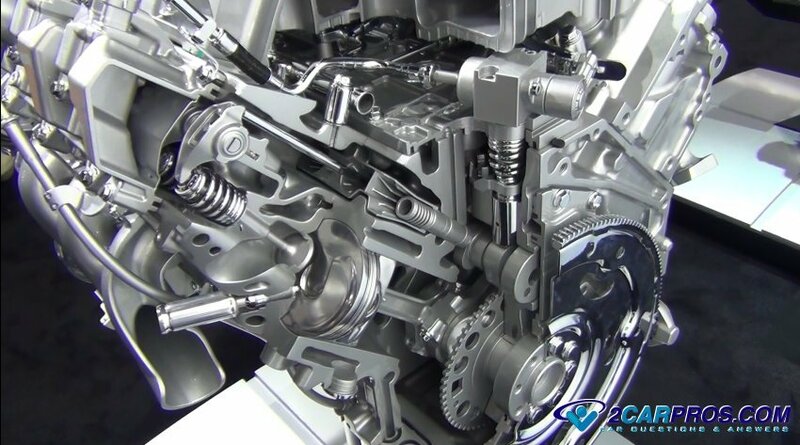 The engine's water pump is driven by the serpentine belt via the pump's drive pulley which is supported by the main shaft bearing of the pump housing. When these bearings fail it can cause the pump shaft to wonder which produces a rattling sound. This may or may not be accompanied by a coolant leak. To check for this problem have the engine off and work the water pump pulley back and forth while looking for play. Excessive movement is an indication the water pump has failed and needs replacement. 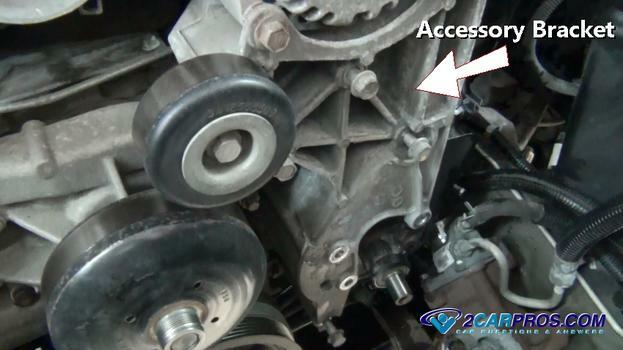 An engine's idler pulley is used to support the serpentine belt between the tensioner, drive pulley and the accessories. This part is basically a pulley with a bearing that is mounted with a through bolt. This pulley can be grooved or smooth depending on which side of the belt it is supporting. To check if this is your problem, remove the serpentine belt and spin the idler pulley to listing for a ratting sound which means the pulley has gone bad and needs replacement. A mounting bracket is used to support the various accessories such as the power steering pump, air conditioner compressor and alternator. If the bolt becomes loose or the bracket breaks it can cause a rattling noise. These brackets can be both cast or stamped steel. Inspect the brackets to make sure they have all of their mounting bolts installed and look for cracks somewhere on bracket. On steel brackets the crack will be accompanied by a rust colored dust at the crack to make it easier to see. If a failure is observed the bracket must be replaced or welded. 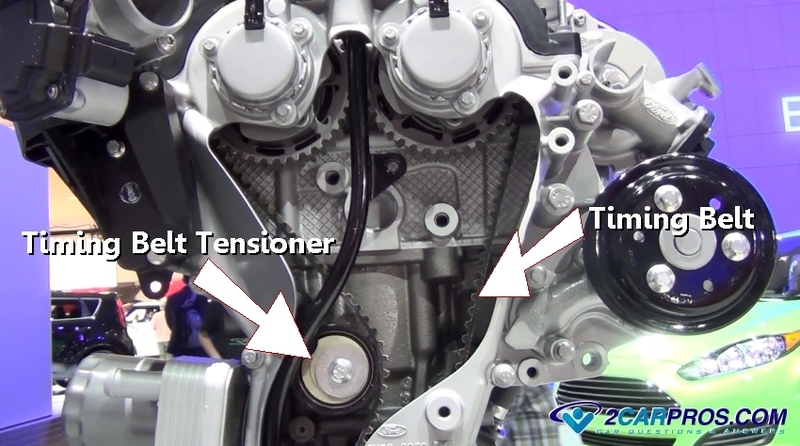 A timing belt or chain tensioner is used to rotate the camshaft(s) that control intake and exhaust valve operation. If this belt, chain or tensioner becomes loose or is failing it can cause a rattle noise that follows the engine RPM's. To check for this condition remove the timing belt or chain cover and use a flashlight to check for excess play or parts of the timing belt that have come off. A harmonic balancer is used to help silence engine vibration by utilizing a counter balancing weight supported by a rubber ring which is located at the front of the crankshaft. 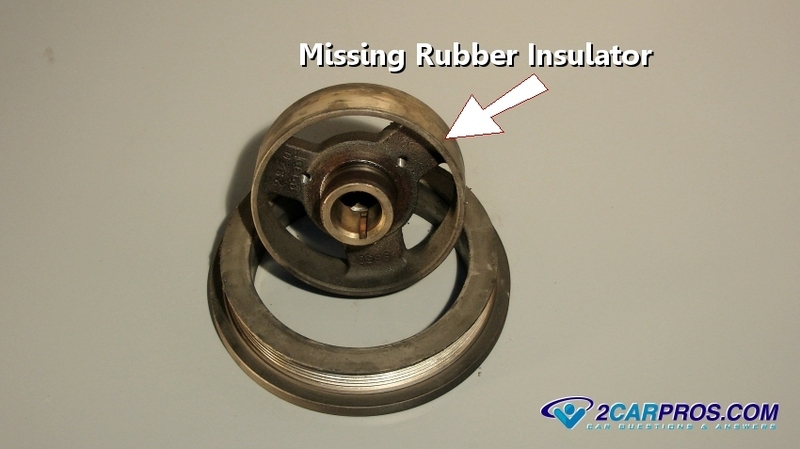 This ring can become dislodged because the rubber insulator has failed. This will allow the outer ring to bounce and jump on the rotating hub which can produce a rattling noise that changes with engine speed. To check for this condition remove the serpentine belt and inspect the harmonic balancer. If the balancer has come apart it must be replaced. You can get the job done by watching the video below. On rear wheel drive cars a fan clutch is attached to the front of the engine to help cool the radiator. If this component fails it can allow the main shaft of the clutch fan to have excessive clearance allowing the main housing to have "play" while producing a rattling sound. To check for this failure (engine off) grasp the fan blade and check for excessive movement. Usually this condition will be accompanied by the engine running hot or overheating but not always. It should turn in either direction as well. The starter motor is used to crank the engine over. This unit has a bendix that is used to engage the starter when in use and then disengage the starter when not in use. The bendix has a return spring that can break allowing the starter bendix gear to contact the flywheel creating a rattling sound which occurs under acceleration. To check for this problem the starter must be removed to see if the bendix gear is not being returned into the starter motor. If the spring is found to be broken the starter motor must be replaced. On vehicles equipped with an automatic transmission a flex plate is used to couple the transmission with the engine. This plate also supplies the starter with a ring gear which is used to start the engine. If this flex plate is cracked or is loose it can produce a rattling noise. The transmission will need to be removed to check the flex plate in most cases. Look for rust colored powder either at the crankshaft bolts or the torque converter mounting bolts. Also look for obvious cracks and missing or loose bolts. Engine ping occurs mostly in older vehicles and is the result of a detonation inside the combustion chamber resulting in an uncontrolled explosion (ping). This ping has been described as an engine rattle. Most engines are equipped with a knock sensor which controls this condition by signaling the computer to retard the ignition timing, but if the fuel octane levels are too low it will cause the engine to ping anyway. If the problem persists the engine could have excessive carbon build up and a de-carbonization service is needed. Here is how our mechanic would go about looking for an engine rattle. If you have any engine rattle questions please visit our forum. If you need car repair advice, please ask our community of mechanics is happy to help you and it is always 100% free.